Sephora and Rimmel sticking together. As a self-confessed makeup clumsy I’ve never had a proper eyeshadow. I’m more of an eyeliner girl. My eyeliners are my eyeshadows; to me an eyeliner becomes one with a bit more spread of colour - this is particularly so for pencil eyeliners not liquid ones. Of the two featured here, I got the Sephora’s Easy Smoky Eye Stick long before the Rimmel's. I was pulled by the promise of ‘easy’ smokey eyes. There were a host of options when I was at the Sephora’s store where this was bought. I have the 05 Marsala Madness, which is a dark pink bordering to brownish purple if shaded heavily. The chubby stick is two-ended. One end sticks out the eyeshadow and the other a brush with a transparent cap. You can twist the brush end to push the eyeshadow out. Interestingly upon purchase the cap which houses the colour was wrapped in plastic but the other cap was not. The texture is creamy and soft in a matte finish and doesn’t have any glitter. My eyes take kindly to it and doesn’t react badly. And yes, it is waterproof. I tried and have it under running water but the colour won’t budge. 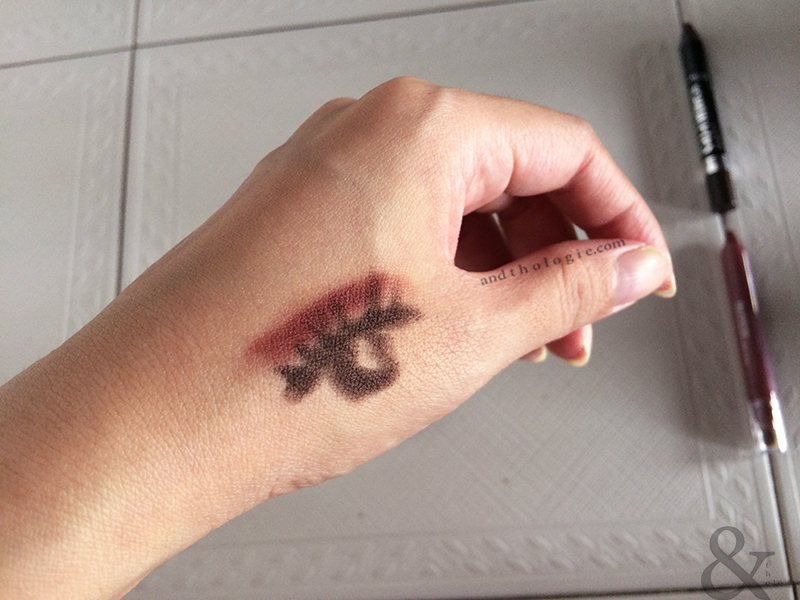 Rubbing it with water will eventually take the colour off after some time, but it will come off easily with any mild cleansers - I don’t even have a special makeup remover, I simply use a Simple Cleanser [too many puns in this post!] to remove my makeup. I find it rather difficult to smudge the Easy Smoky Eye, either with the brush or finger. I will explain a bit later. The caps off; much too contrived. I bought this from Asos.com along with the Weekday’s lingerie set which I have reviewed. The shadow did not come with a protective plastic wrap like the Easy Smoky Eye, which I think lack that peace-of-mind that you get from one. I’ve always preferred a brown liner as opposed to a solid black because of its forgiving quality and subdued effect that can be added on to a bolder finish. This is no different; I’ve got the 014 Bootleg Brown. 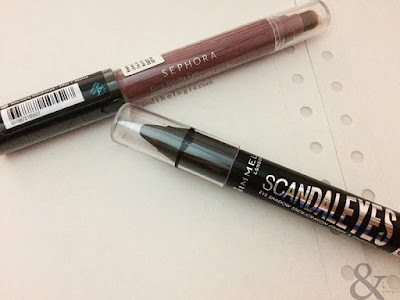 The texture of the Scandal'eyes is somewhat similar to the Easy Smoky Eye; soft and doesn’t tug too much on the skin. Again as a test, I put the shadow under running water, the colour stayed put and did not drip. It also doesn’t come off easily when rubbed. Wiping it off with a Guardian’s Wet Wipe required a bit of rubbing that made my skin red, so I’d suggest a proper cleanser similarly as mentioned above. Not my real eye but could be. These observations are true for both shadow sticks. There’s always that option of one bold line, which I often opt to do with the Scandal'eyes. But for true smokey eyes, both of these are not easy to smudge. In fact almost impossible. So they can’t be worn like the usual draw-and-smudge method. If you try to you’ll only have the colour off on your finger or brush, not on your eyes. 1. colour the area I want to be the base, take some of the colour off by smudging and then draw a few more layers of colour to create the gradient effect. I find this method wasting a lot of product. 2. draw on lightly and evenly over the area where I want to have as the base and then blend or try to - the key here is ‘evenly’ because darker strokes will be left unblended. I have managed to be able to control the strokes so that I don’t need to blend. And then add more colour to the area where I want it darkened so as to create a gradient. Obviously I prefer the second method. But a note of caution if you leave the colour long enough there will be clumping if you try to layer on or smudge, so you will need to do whatever you need to do quickly before the shadow settles. 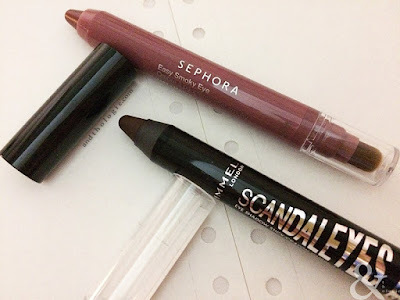 Do share your preferred methods and which look do you prefer with these eyeshadow sticks.